This frenetic T-rated action game is taking over the world right now. Gaming trends for kids can catch on so suddenly, and evolve so quickly, that it’s easy for parents to be left struggling to keep up. That’s why SuperParent is here, to help navigate the often bewildering worlds that our kids choose to play in. Right now, one of the most popular games in the world – and certainly in the schoolyard – is Fortnite, a multiplayer action game that has made headlines for its addictive nature. 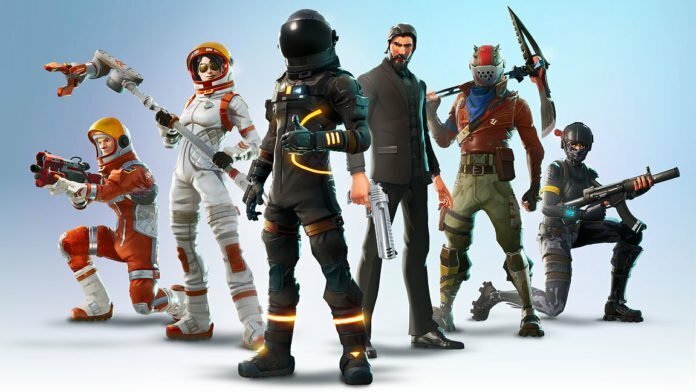 First released in the summer of 2017, Fortnite was developed by Epic Games and People Can Fly, who between them are responsible for hit games such as Gears of War and Bulletstorm. Those titles are Mature-rated gorefests, but Fortnite is a less intense Teen-rated experience, with colorful cartoon graphics and no bad language or blood. It’s available on PlayStation 4, Xbox One and PC. There are actually two games to consider here. The core game must currently be paid for and is based around a “Save the World” mode with players cooperating as they venture out into a monster-infested world to gather resources, which they then use to fortify their defenses against attacks from the skeleton-styled enemies. In September of 2017, a new game mode was added and also released as a free standalone title called Fortnite Battle Royale. In this mode, up to 100 players parachute into a shared map and must battle until only one player – or one team of four – is left. It’s this mode which has proven particularly popular with kids, thanks to its relentless action and wacky costumes. Players start the game with no weapons, only a pickaxe to gather resources, and must rely on what items they find randomly scattered across the map to survive. The action is heightened by a deadly storm which creates a circular safe zone that constantly shrinks, forcing the remaining players closer and closer together. Crucially, there are no extra lives or respawns in Battle Royale. In other words, if another player kills you, that’s it – you’re out of the game and can only spectate until the next game starts. This “battle royale” game style is very popular right now, influenced by The Hunger Games books and movies, with a notable pioneer in the genre being PlayerUnknown’s Battlegrounds (or PUBG) for PC and Xbox One. This game is also rated for Teens but features more realistic graphics and bloodier deaths. Is the content suitable for kids? As the rating suggests, Fortnite is considered appropriate for ages 13 and up because it features violence. While the core game’s Save the World mode requires cooperation between players, Battle Royale is a very ruthless way of playing – even if the graphics are not explicitly gruesome. Emotions tend to run high, especially because of the strict no-respawn rule which gives matches a high stakes “all or nothing” feel. It’s also an online game, with a lot of players in each match, and there are no guarantees that the people your child will be playing against will restrict their language or behavior accordingly. As with any online game, you should acquaint yourself with the game’s voice chat settings and make sure that your child is only conversing with their friends, not being trash-talked by random strangers. Are there any additional payments? The Battle Royale version of the game is free to download, but does offer a paid option called Battle Pass. These are released in “seasons” like a TV show, with each season costing $10 and adding 100 skill tiers to the game that players can work through, earning new costumes and gadgets. Unlike games which offer blind “loot box” upgrades, where rewards are handed out at random, the Battle Pass lets you see what you will unlock at each tier. This is arguably better for kids, as it removes the gambling-style reliance on the luck of the draw, and instead encourages forward planning as they work toward a visible goal – such as a specific glider or character skin. Should my kids be playing it? In terms of content, there’s nothing in Fortnite’s Save the World or Battle Royale modes that should be problematic for older children and teens, other than their focus on weapons-based combat. The Battle Royale mode, available as a free download separate from the core Fortnite game, is particularly focused on hunting and killing other players, and the fact that players are out of the match after one death can lead to some emotional outbursts. Like any well-designed game with a social aspect, Fortnite is also very compelling, and with matches that go on much longer than other action titles, it may be harder to restrict gaming time without friction, especially as quitting a match before it’s over is considered bad form. There is also much about Fortnite that can be seen as rewarding and worthwhile. It encourages self-sufficiency and tactical thinking, playing in a team means communicating and cooperating, and the one-life limit also means players must carefully balance risk versus reward before acting – all useful skills for teens to practice, even in a cartoon virtual world.